Chaitanya Mahaprabhu appeared as a devotee of Krishna in Mayapur, West Bengal, India in the late fifteenth century. He introduced sankirtan, widespread congregational chanting of the Supreme Person's names, as the most effective means by which anyone can achieve spiritual perfection. By His influence, many of India's leading religious scholars and their followers became devotees of Krishna themselves. In His youth, Mahaprabhu started a Sanskrit academy in Navadvipa—one of India's top centers of learning at the time—and earned a reputation as an excellent scholar. But at age twenty-four he renounced everything to travel the subcontinent, encouraging everyone he met to chant the Hare Krishna mantra. He is considered by disciples, scholars and followers to be the latest avatar of Krishna Himself, based on extensive evidence found in Vedic literature. The International Society for Krishna Consciousness, ISKCON, is a continuation of Chaitanya Mahaprabhu's sankirtan movement. Mahaprabhu's humble, saintly demeanor and knowledge of Vedic conclusions persuaded prominent impersonalists that Krishna consciousness, worship of the Supreme Person, is life's highest purpose. On Mahaprabhu's instruction, the Six Goswamis of Vrindavan made a thorough analysis of the Vedas to show that Krishna bhakti, devotional service to Lord Krishna, is the essence of all Vedic teachings. 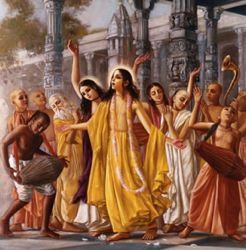 Mahaprabhu's extensive conversations with His devotees such as Ramananda Raya and Sanatana Goswami form the philosophical and scriptural basis of Gaudiya Vaishnavism, or Krishna consciousness. Chaitanya himself left only eight written verses, the Siksastaka, in which he teaches that chanting God's names is the most simple and sublime spiritual practice for everyone, everywhere. He also showed such extraordinary symptoms of love of God that great scholars among His devotees, including the Six Goswamis, have cited considerable scriptural evidence indicating that Chaitanya Mahaprabhu is Krishna Himself appearing as His own devotee. Image shows Chaitanya Mahaprabhu chanting in sankirtan with His associates. Lord Chaitanya and the Renaissance of Devotion - A socio-historical examination at the significance of Chaitanya Mahaprabhu's advent, mission, and reasons for appearing when He did. Sri Chaitanya's Life and Mission - Some significant dates and highlights of Mahaprabhu's mission. Sri Chaitanya in the Vedas - a compilation of scriptural references indicating that Krishna and Chaitanya Mahaprabhu are one and the same. "In the age of Kali, intelligent persons perform congregational chanting to worship the incarnation of Godhead who constantly sings the names of Krishna. Although His complexion is not blackish, He is Krishna Himself. He is accompanied by His associates, servants, weapons and confidential companions." Srimad-Bhagavatam 1.7.13-14, purport: "Lord Krishna Chaitanya is Krishna Himself in the garb of a devotee of Krishna, and therefore the versions of both Lord Krishna and Sri Krishna Chaitanya Mahaprabhu are identical." Srimad-Bhagavatam 3.33.4, purport: "Sometimes the Supreme Personality of Godhead Himself wonders how much transcendental pleasure is within Himself, and in order to taste His own potency, He sometimes takes the position of tasting Himself. Lord Chaitanya is Krishna Himself, but He appears as a devotee to taste the sweetness of the transcendental mellow in Himself which is tasted by Srimati Radharani, the greatest of all devotees." "Lord Gaura, who is the all-pervading Supersoul, the Supreme Personality of Godhead, appears as a great saint and powerful mystic who is above the three modes of nature and is the emblem of transcendental activity. He disseminates the cult of devotion throughout the world"
Chaitanya-charitamrita, Adi-lila, Introduction: "Lord Chaitanya Mahaprabhu should therefore not be considered one of us. He is Krishna Himself, the supreme living entity, and as such He never comes under the cloud of maya. Krishna, His expansions and even His higher devotees never fall into the clutches of illusion. Lord Chaitanya came to earth simply to preach Krishna-bhakti, love of Krishna. In other words, He is Lord Krishna Himself teaching the living entities the proper way to approach Krishna. He is like a teacher who, seeing a student doing poorly, takes up a pencil and writes, saying, 'Do it like this: A, B, C.' From this one should not foolishly think that the teacher is learning his ABC’s. Similarly, although Lord Chaitanya appears in the guise of a devotee, we should not foolishly think He is an ordinary human being; we should always remember that Lord Chaitanya is Krishna (God) Himself teaching us how to become Krishna conscious, and we must study Him in that light." Chaitanya-charitamrita, Adi-lila 1.4: "May the Supreme Lord who is known as the son of Srimati Saci-devi be transcendentally situated in the innermost chambers of your heart. Resplendent with the radiance of molten gold, He has appeared in the Age of Kali by His causeless mercy to bestow what no incarnation has ever offered before: the most sublime and radiant mellow of devotional service, the mellow of conjugal love." Chaitanya-charitamrita, Adi-lila 4.41, Purport: "Lord Chaitanya did not invent a system of religion, as people sometimes assume. Religious systems are meant to show the existence of God, who is then generally approached as the cosmic order-supplier. But Lord Sri Chaitanya Mahaprabhu’s transcendental mission is to distribute love of Godhead to everyone. Anyone who accepts God as the Supreme can take to the process of chanting Hare Krishna and become a lover of God. Therefore Lord Chaitanya is the most magnanimous. This munificent broadcasting of devotional service is possible only for Krishna Himself. Therefore Lord Chaitanya is Krishna." Chaitanya-charitamrita, Introduction: "In order to study Radharani, Krishna lived in Her role and tried to understand Himself. This is the secret of Lord Chaitanya’s incarnation. Chaitanya Mahaprabhu is Krishna, but He has taken the mood and role of Radharani to show us how to love Krishna."